Have You Seen Our Premier Issue Yet? The premier issue of Around Woodstock magazine was released at the beginning of November, and we are thrilled with the feedback that we have been getting from the community. Our goal is to be your “go to” primary resource for local information whether it be about events or local merchants in the Woodstock area. 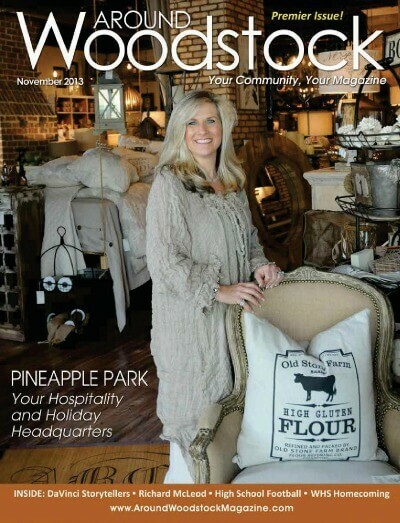 The cover story on our first issue features the unique furniture and home furnishings store Pineapple Park on Chambers Street in Woodstock Downtown. The goal at this store is to create a relaxed stress free shopping environment so that customers can take their time and explore the unique treasures that can be found in every nook and corner of the store. Additional stories include an update on the Cherokee County School District from District 2 School Board Representative Patsy Jordan. There is also a look back written by Ann Litrel after speaking with former Director of Community Development of Woodstock, Richard McLeod on what it took to bring together developers and elected officials to approve and build the development of what has become the popular mixed use development of Woodstock Downtown. As is the tradition in our sister publication the Townelaker, we also have included pictures from local events including homecoming at Woodstock High School and photo feature pages on all of the high school football teams in our service area, River Ridge, Sequoyah and Woodstock. Make sure you check out the Calendar of Events Page as well as our directories of local Woodstock clubs, organizations, local officials and places of worship. To see all of this and much more you can always find our most recent issue available on the home page of our website or you can Click Here to see the list of locations where the magazine can be picked up at local retailers. We hope you enjoy this as well as all our future issues!